Mysuru: Bahujan Samaj Party (BSP) President and former Uttar Pradesh Chief Minister Mayawati arrived in city this morning. She will address a mega election rally at Maharaja’s College Grounds at 4 pm. The BSP leader, called “Behenji” by her followers, will campaign from today for the victory of her party and JD(S) candidates for the May 12 elections to Karnataka Legislative Assembly. At Maharaja’s College Grounds, she will share the dais with JD(S) Supremo and former Prime Minister H.D. Deve Gowda, JD(S) State President and former CM H.D. Kumaraswamy and MLA G.T. Devegowda, who is seeking a re-election from Chamundeshwari constituency. BSP and JD(S) have aligned in Karnataka and Mayawati’s party has fielded candidates for 20 seats. As part of her campaign, Mayawati will address rallies in Chitradurga on Apr.26, Kolar, Belagavi, Kalaburagi and Raichur on May 5 and 6. The BSP leader arrived at Mysore Airport in Mandakalli by a special flight and her convoy drove to Hotel Radisson Blu Plaza. After lunch and some rest, Mayawati will proceed towards the Maharaja’s College Grounds at 3.30 pm. Bahujan Samaj Party President and former Uttar Pradesh Chief Minister Mayawati, who arrived in city this morning, checking into one of the rooms at Hotel Radisson Blu Plaza. Picture right shows Police personnel and Hotel Security Manager Ashok supervising the security measures at the Hotel before Mayawati arrived. Mayawati enjoys Z Plus Category security and when she was in power in UP, over 400 armed commandos in 40 armoured vehicles guarded her wherever she went. Now with the change in government in the northern State, the security has been reduced. But she still enjoys Z Plus security. Today when she arrived at the hotel in city, over four gun-toting commandos, accompanied by officers dressed in black attire, guarded her and a separate team was guarding her plane at Mandakalli. 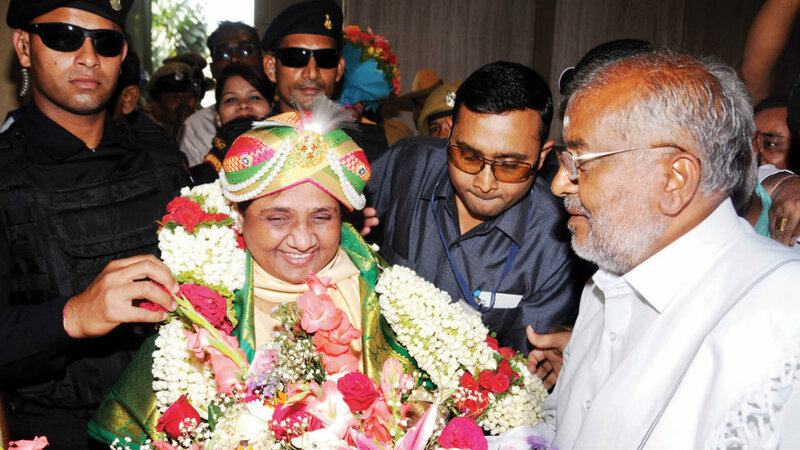 It is Mayawati’s third visit to Mysuru region. She had visited Mysuru in 2008 and campaigned for a BSP candidate and also campaigned for the party candidate in Kollegal in 2013. 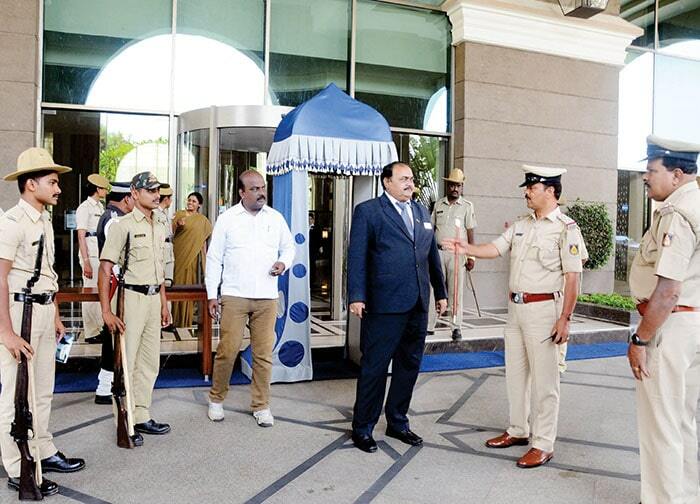 Though the security officials did not permit the local JD(S) and BSP leaders to receive Mayawati at the Mysore Airport, she was received at Hotel Radisson Blu Plaza by MLA G.T. Devegowda, Narasimharaja JD(S) candidate Abdul Azeez, Chamaraja JD(S) candidate Prof. K.S. Rangappa, Hunsur JD(S) candidate A.H. Vishwanath and Kollegal BSP candidate Mahesh. Police personnel and Hotel Security Manager Ashok supervising the security measures at the Hotel before Mayawati arrived. Along with Mayawati, her trusted aides MP Dr. Ashok Siddharth who is in-charge of Karnataka, G.P. Upasak and Rajya Sabha Member Satish Chandra Mishra have also arrived and the leaders are expected to hold a series of meetings today to chalk out strategies that will benefit both JD(S) and BSP. At the Maharaja’s College Grounds, a huge stage has been set up and only VIPs will be allowed on the stage. Over 25,000 chairs have been laid for the people to participate in the rally. BSP symbol the elephant and the blue colour is dominating the venue. The stage has a banner that portrays “Kumara Parva”, the campaign slogan of the JD(S). After the rally at Maharaja’s College Grounds, Mayawati will fly to Bengaluru and tomorrow she will proceed towards Chitradurga. the way mayavati is projecrted by jds. let her become cm and this loose hdk just a minister. i do no know why she is brought her. she is an outside to our state. please do not vote even a single vote to mayavati party. Dr. M. Shanthakumar, this is very arrogant statement by you, Behenji is not an out sider, she is not from pakisthan, Behenji is an asset of our country, she gave wonderful administration when she was chief minister of Uttar Pradesh, she never killed anyone in the name of politics and she promoted peace and harmony in her state, her law and order is appreciated by everyone irrespective of party, BJP is headed by criminals and killers of humanity, today many people are copying her way of keeping the law and order in many ways, what non sense you speak about behenji, she was 4 time chief minister of most largest state in the country. She has come for campaigning for her party and JDS candidates, this is a routine elections campaign, I think you are suffering from Manuvadi Mindset and castiest polluted thinking, be careful about writing about speaking about national leader , voters are the backbone of every constituency, they choose the candidate of their own selection, people never listen to you while giving votes, maintain certain decency in life. i have every right to express my views. you are no body to question me. mind your business . my statement is 100% perfect aboau5t mayavati and she is spoiling the country . the elephants that she built is a n indication how this diriest lady behaving in our country. her wonderul admiistration is for having constructed elephants at each road corners ! Shanthakumar she is not an outsider. And the park u are talking about has garner more revenue than the amount of money then she spent on it. Why u are baised SCST OBC too should have monuments and memorials. They have right to know their history and leader. They should have places to visit and feel that yes they sth in this country. Everywhere tehy go they see only brahminical structure which oppressed them . Now Modi has inaugurated Dr.Ambefkar international Museum. Now criticise him. He has some more plan to build Ambedkar memorial. Have you seen the design of Amravati which has Buddha statue and Ambedkar park. A big Ambedkar park is comming up Maharastra by BJP government near indu mill. Criticise all of them. U are such a looser attitude.